When the sun is shining, it’s the perfect time to start a garden or freshen up an existing garden. What better way to do so than with some beautiful plants or flowers from the nursery or your local garden center? Check out the 10 best garden centers and nurseries that Indiana has to offer to beautify your garden this year! Located off State Road 26 in Kokomo is the Salsberry Garden Center. Serving the Kokomo area for the last 40 years, Salsberry Garden Center has an amazing assortment of flowering plants, hanging baskets, trees, shrubs, and more! The customer service is fantastic, and the selections are incredible. You’ll find everything you need for your next project here at Salsberry. Be sure to ask about their landscaping services as well as if you aren’t sure what direction to take! McCoy’s Nursery and Landscaping, formerly known as Bethany Gardens, has been family owned and operated since 1965. Located in southern Indiana, just 15 miles from Louisville, Kentucky, McCoy’s serves customers in both southern Indiana and northern Kentucky. What makes McCoy’s different from other garden centers and nurseries? They have focused on being a garden center, full time. McCoy’s is all about providing excellent customer service in addition to quality products, plants, and landscaping services. They also have some of the best herb and veggie selections as well! Farther down in southern Indiana is Hidden Hill Nursery, a “unique” and “unusual” plant nursery. It is also a mini arboretum and sculpture gallery. Bob and his staff provide visitors with a pleasant experience every time, and are knowledgeable and provide amazing customer service. Even if gardening isn’t your thing, Hidden Hill Nursery has some of the most beautiful plants and flowers to stop and smell as well as photograph. Heller Nursery in Decatur, Indiana, has been a family owned and operated nursery, greenhouse, and garden since 1946. The Hellers have been supplying quality plants and other supplies to northeast Indiana for the last 60 years, and are dedicated to their customers. The greenhouse is a site to behold with so many selections of plants and shrubs and flowers. When you walk in, it’s as though your cares have drifted away and Mother Nature is soothing your soul. Heller’s also has an amazing selection of fruit trees to choose from, as well as asparagus and berry trees. There is something for everyone here! Grant Line Garden Center and Nursery in New Albany, Indiana, has been in business for over 30 years. One of the things that sets Grant Line Garden Center and Nursery apart from other garden centers and nurseries is that they are 100 percent pesticide free, using only beneficial insects for pest control. They also carry non-GMO seeds and bulbs, something else you don’t see in other garden centers or nurseries. 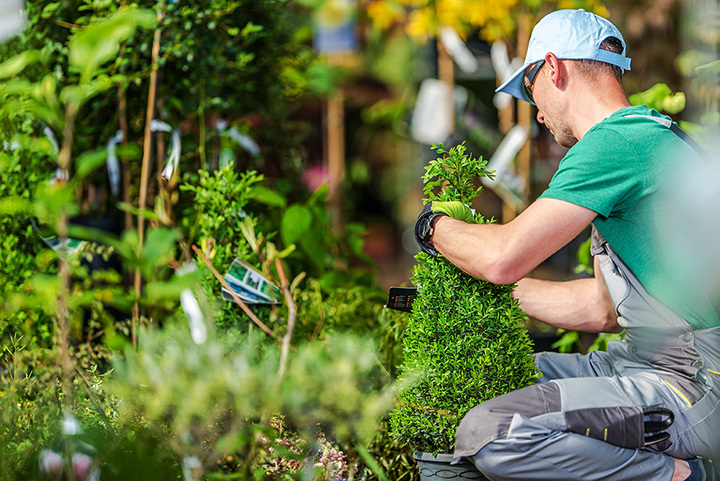 The staff here at Grant Line are friendly and knowledgeable, and believe in helping you create the garden and landscape of your dreams, while also helping you care for it and sharing tips and tricks along the way! Garden Gate Greenhouse in Peru, Indiana, has been in business since 1974. When you visit this amazing greenhouse, it is easy to see why they’ve won Miami County’s Garden Center of the Year award for many years. With expansion and renovation, GGG now has over 65,000 acres to display their beautiful flowers, plants, and other foliage and shrubs. GGG believes in providing quality products and exceptional customer service to their customers while enhancing the Peru community, using “humility and gratefulness to honor God.” GGG is an amazing place to be, even for those who don’t necessarily garden. Head on down to Brownsburg, Indiana, and visit Frazee Gardens! Frazee Gardens is a full-service nursery and they have a wide variety of trees, shrubs, flowers, herbs, vegetables, and so much more! There is something for everyone here at Frazee Gardens. Plant some beautiful Asiatic lilies and enjoy their beautiful colors to brighten up any garden. Be sure to check out their vegetable and herb selection! Dammann’s Garden Centers are all locally owned and operated throughout Indiana. Each plant is American made, grown in Indiana. They believe in helping other local businesses throughout Indiana, something you don’t see in most businesses, making them unique. Dammann’s also has one of the largest selection of trees, shrubs, plants and more! The best thing about Dammann’s is they help you care for each plant as if it were a person, from the amount of light to the amount of water each plant should receive. They believe in helping customers grow and care for the plants to the best of their abilities. The owners and employees provide fantastic customer service, and make each experience worth coming back for! This place is incredible, and it’s not a wonder it’s considered to be one of the Midwest’s best known garden centers! No matter your planting needs, you are bound to find something here at Sundown Gardens. If you aren’t sure how to plan your landscape or need some ideas, talk to their landscaping experts! You’ll be glad you did and your landscape will thank you! Rosie’s Gardens in Indianapolis was born from a dream in 1982, and originally started as a Christmas tree farm during the winter months. For over 20 years, Rosie’s Gardens has been providing the residents of Indianapolis and surrounding cities with beautiful landscaping, fabulous plants, and beautiful flowers and other foliage. The focus of Rosie’s is to provide customers with high quality selection of plants and other garden materials, while helping their customers to become better gardeners in the process.